Slow run rate from Himachal Pradesh batsmen forced it to share a point with Assam as their Group C Ranji Trophy match ended in a tame draw. 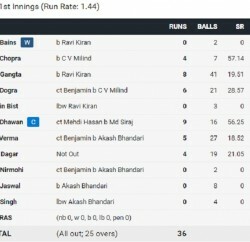 Replying to Assam’s first-innings total of 354, Himachal Pradesh were 316 for five when stumps were drawn for the final time at the end of fourth day’s play. Earlier, Hiamcahl batsmen were struggling as they have lost their top five wickets 173 for, but with the fantastic inning of 114 from all-rounder Rishi Dhawan and Aatish Bhalaik, who remained unbeaten on 57, save the important point for the side. Both consolidated the team position in their 143-run sixth-wicket partnership at the Nehru Stadium, Guwahati. In his 165-ball knock, Rishi Dhawan slammed 15 fours and a six, while wicketkeeper-batsman Aatish Bhalaik played sensibly and found the fence eight times in the match. 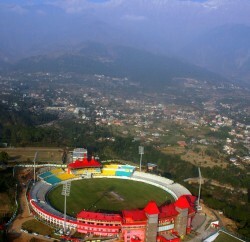 Himachal Pradesh 1st innings: 316 for five in 124 overs (Rishi Dhawan not out 114).